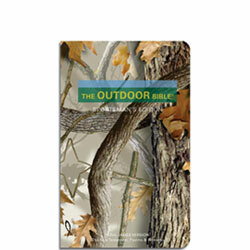 Out of Print Editions → KJV The Outdoor Bible New Test. Psalms & Prov. KJV The Outdoor Bible New Test. Psalms & Prov. The Outdoor Bible will give you the freedom and inspiration to take God's Word with you wherever life takes you. Combined with the timeless and cherished KJV translation, this New Testament with Psalms and Proverbs offers unsurpassed versatility and confidence to go anywhere.